Soon after retiring from public teaching, Thelma Bonzek ’43 treated her former Syracuse professor Robert “Bob” Newman to lunch. The duo (along with their respective spouses, Joe Bonzek and Katherine Hughes ’91, ‘07) rekindled their affiliation over coffee and sandwiches, while espousing the merits of individualized education—a contrast to the more prevalent one-size-fits-all model. That was more than 20 years ago. 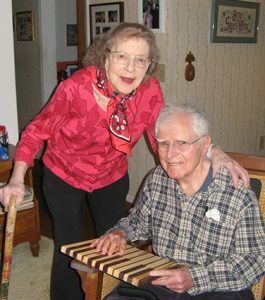 Since then, the association has outlived Bonzek’s 66-year marriage to Joe, who died of cancer in 2012. As Newman, 91, adapts to life with advanced stage Parkinson’s, Bonzek wonders when she and Katherine will have only each other. Anyone who has set foot in or driven by The New School—a modest, two-story dwelling on Jamesville Road, which winds its way through the hushed suburb of DeWitt—has Newman to thank. He started the school’s predecessor, the Syracuse Institute of Enabling Education (SIEE), in 1970, while serving on the faculty of the University’s School of Education. Newman conceived SIEE as an alternative elementary school, where teachers, parents and children could function as a collaborative unit. His approach was not necessarily new, explains Mary Cunningham G‘05, who co-founded The New School in 1988, following a decade-long teaching stint in SIEE. “In the ongoing argument over which was primary [the child or the curriculum], Bob believed the child came first. 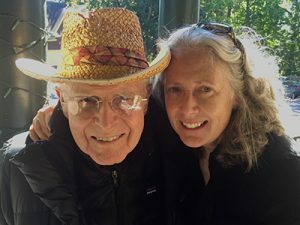 He was a man who had the courage of his convictions,” she says, adding that he drew inspiration from the reformist writings of John Dewey, Jean Piaget, Lev Vygotsky and Carl Rogers. Newman came to Syracuse in 1965 as the free school movement was gaining momentum. His previous experience included serving as a principal at The University of Chicago Laboratory Schools (co-founded by Dewey in 1894) and teaching in a one-room schoolhouse in the hills of Northern California. Hughes, who teaches part-time in the Community Folk Art Center, says the latter experience was particularly formative for her husband because it made him switch up his game. “His students in California ranged in ages from six to 14, so he had no choice but to individualize his curriculum. This became the basis for all his teaching from then on,” she adds. In the late ‘60s, Newman received a grant to launch a graduate program in the School of Education for mid-career workers interested in careers in teaching. Bonzek, a pianist and area music educator, was one of his students. She says his signature style worked on adult students, too. The associate professor then helped launch SIEE, which, according to Cunningham, viewed teachers as “co-learners and partners” with students. By local standards, the approach was radical—allowing each child’s passions and interests to dictate his or her learning outcomes. Newman so believed in the institute’s mission that he enrolled his two daughters there. SIEE addressed other hot-button issues, including teacher stress, burnout and attrition. It was a space, Newman maintained, for students and teachers alike to stretch themselves, intellectually, artistically and socially. As proponents of experimental education know, schools such as SIEE have ebbed and flowed in popularity, owing to various political, economic and socio-cultural factors. In 1982, Newman took early retirement from Syracuse, and turned his attention to other projects, including consulting and writing. His best-known books are “A World Where We’re All in This Together” (Split Oak Press, 2013) and “Building Urban Little Schools: Where Children Succeed with Dignity” (Brookline Books, 1999). Newman also handed Cunningham the keys to the SIEE kingdom, from which emerged The New School. Thirty years on, the school flourishes—a testament to Newman’s unwavering belief in critical thinking, active citizenship and lifelong learning. “He has created a legacy that lives on through many people,” Cunningham says.